Have you ever had a fudgsicle? It’s a chocolate-flavored popsicle, with a pudding-like consistency, and I used to beg my parents to buy them at the grocery store when I was a kid. 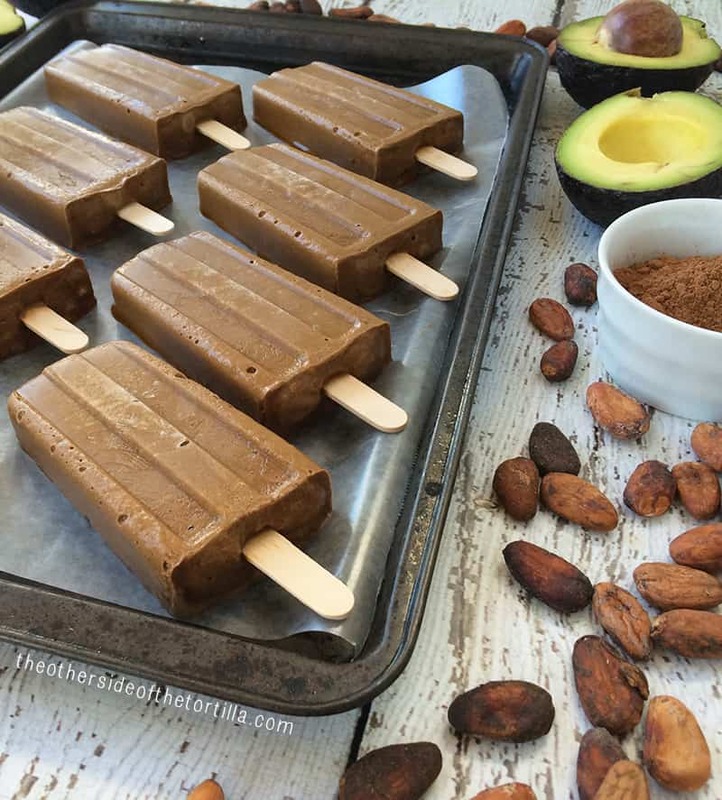 I developed the recipe for these vegan avocado and cacao paletas with those fudgy popsicles from my childhood in mind. As an adult, I like to give things a healthier spin when I can and since I have a vegan in the family, I wanted to make them in a way that she could enjoy them with me, which meant they couldn’t have any dairy. 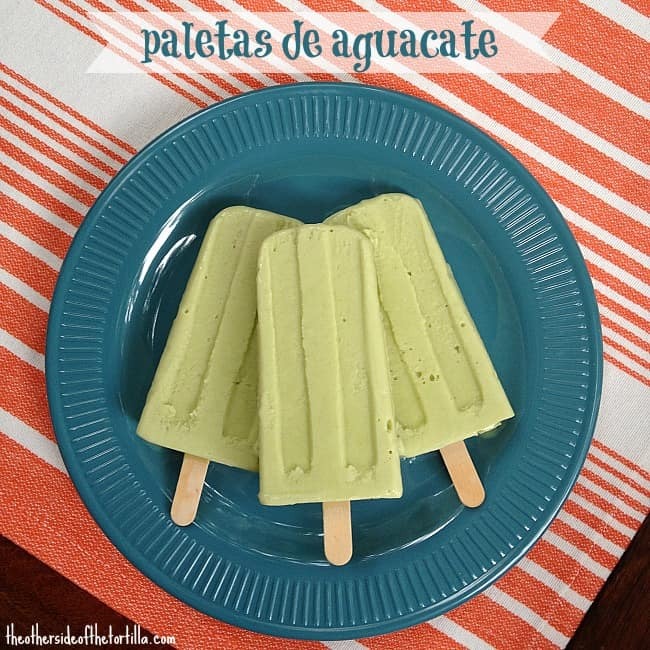 These are similar to my avocado popsicles, with a few tweaks to make them vegan-friendly. The avocado gives the popsicle a creamy, silky base, and coconut milk mixed in helps the popsicles freeze consistently and stay together when you remove them from the mold. Guacahummus sounds a lot like what you might imagine it to be… guacamole (sort of) mixed with hummus. Actually it’s a blend of hummus, avocados and lime juice. I served this simple, healthy dish at my #iloveavocados live party with Avocados From Mexico recently and surprisingly, most of my guests were having it for the first time. The dish was definitely a hit—they scraped every last morsel out of the bowl. The main reason why this dish is so great—aside from being very healthy—is that you can make a semi-homemade version with a store-bought hummus of your choice (I like Sabra’s classic hummus), which helps you get this dish from food processor to plate in about five minutes. I use a 3-cup Cuisinart mini prep (available in my Amazon aStore, El Mercadito), which fits the ingredients perfectly. A bonus: This recipe is both vegetarian and vegan-friendly and is also gluten-free. 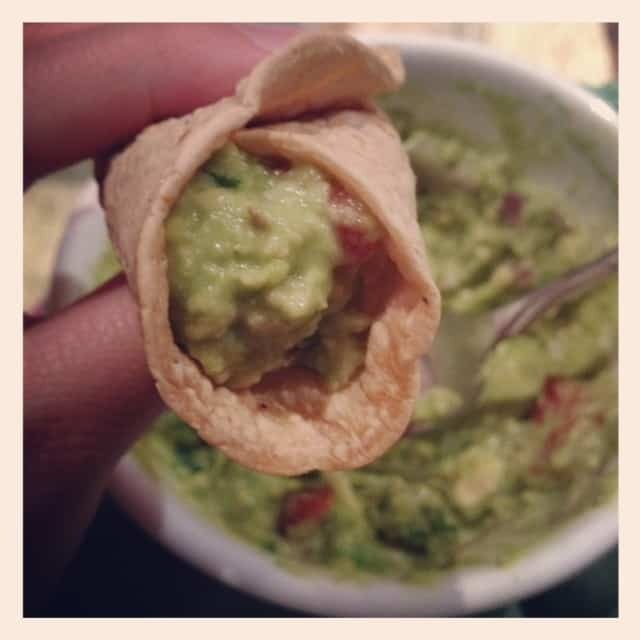 This post is part of a compensated campaign in collaboration with Latina Bloggers Connect and Avocados from Mexico but my love for avocados from Mexico is 100 percent authentic and the opinions and recipe in this post are my own. This post includes affiliate links to my Amazon aStore, El Mercadito, recommending products that I used to make this recipe. Summer means paleta time in my house. And though we like the traditional flavors, I also like to branch out and make flavors that are considered “normal” in Mexico, but that are not as common to see in the U.S., such as avocado. A few friends have looked at me sideways when I said I was working on a popsicle recipe with avocados, but I assure you that you’ll be won over by the creamy texture and pleasantly earthy, sweet taste. I prefer to buy avocados from Mexico because of that distinctive, earthy taste due to the fertile volcanic soil in which they’re grown. They’re packed with nutrients and are a versatile ingredient that can be used in both savory and sweet dishes—but most people don’t think of using avocados in a sweet dish. The thing I especially love about this recipe is that the light coconut milk and sweetened condensed milk (also known as lechera) don’t overpower the natural flavor so you can still taste the earthiness of the avocado…. Posadas navideñas are one of my favorite times of year, but they can also be a stressful time with relatives and friends dropping by with short notice. 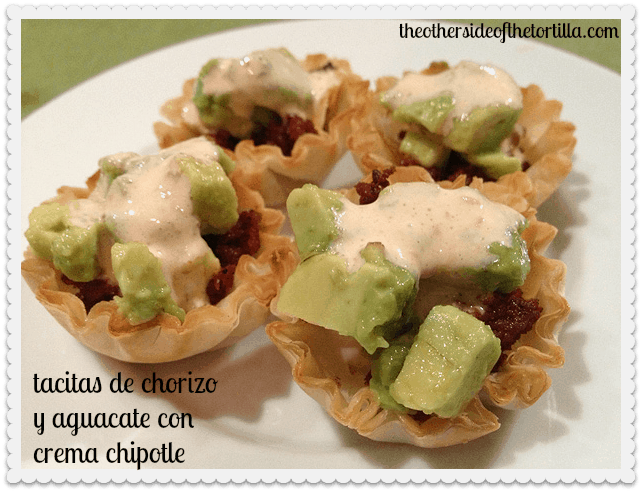 These chorizo and avocado cups with chipotle cream are sure to please your crowd, even if you don’t have much time to prepare. Since we typically head to Mexico for the holidays, it’s not as stressful for me because I usually don’t have to play hostess. But my family threw me a bit of a curve ball this year when they requested I bring a dish of some kind to the posada at my tía’s house the same day that I arrive. I immediately began to think about what I could make that would be simple but authentic and satisfying, and that I could whip up with only a few hours in between the airport and heading to the posada. I decided on this easy appetizer because it has only six ingredients and one of them can be bought already prepared. Many families celebrate posadas like potluck dinners where everybody is responsible for bringing a dish. But in this case, everyone in our family is assigned with tasks ranging from bringing food to a piñata, being in charge of taking photos and so on. Everybody does their part so that the party runs smoothly, even down to the end when someone is responsible for helping clean up the dishes. While this recipe isn’t a traditional one, like, say, an ensalada nochebuena, it’s an excellent savory appetizer that you can incorporate into your holiday traditions. I usually have most of the ingredients on hand, and I bet you do too. You can easily make this appetizer a bit healthier and vegetarian-friendly by swapping the chorizo for soy chorizo. 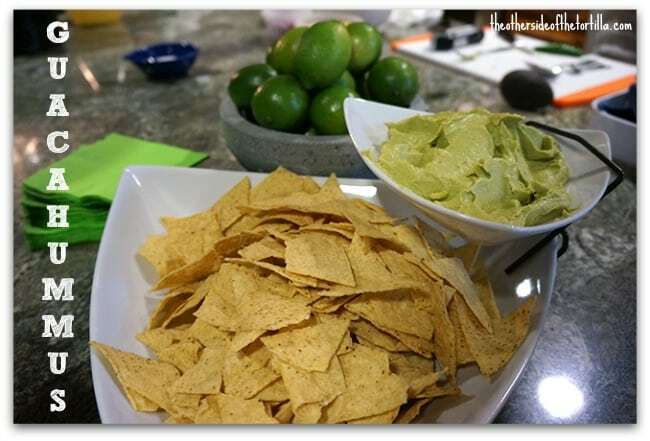 An easy appetizer for posadas and other holiday parties using Avocados from Mexico. Cook the chorizo, drain grease on paper towels and set aside. Prepare the crema in a mini food processor or blender by adding the crema, chipotle chile and adobo sauce and blend until smooth. Refrigerate until ready to use. Preheat the oven to 350º F, then bake the shells on a cookie sheet for 3-5 minutes. Remove them from the oven, add 1/2 teaspoon or so of chorizo into each cup and put back in the oven for 3-5 more minutes. Score the avocados two ways while still in the skin and scoop out into a bowl. 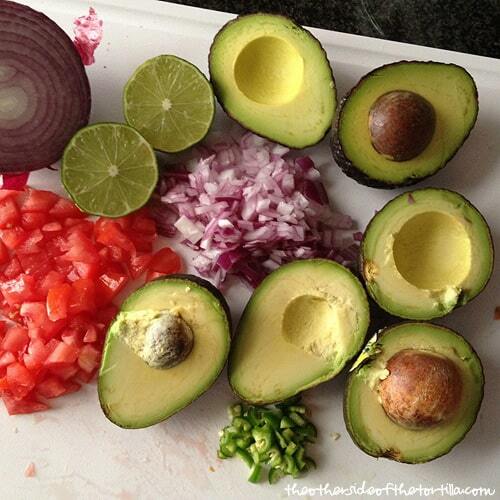 Squeeze lime juice over the avocado and gently toss with a spoon to coat the avocados with the juice. Once the chorizo cups are out of the oven, spoon a little avocado over each cup, followed by a little crema. 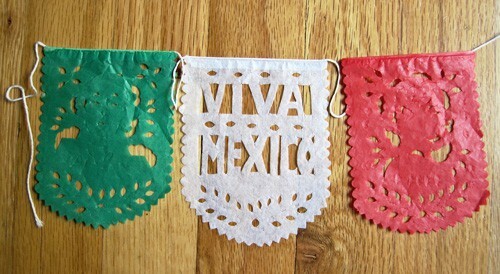 For more avocado recipes for posadas or avocado recipes for any time, visit Avocados from Mexico’s website. And check out the blog hop below for holiday recipes using Avocados from Mexico from other bloggers. Disclosure: This is a sponsored post through Latina Bloggers Connect to promote Avocados from Mexico. We received compensation for writing this post, but all opinions and recipes are our own. Mark your calendars, because we read that November 14 is National Spicy Guacamole Day! 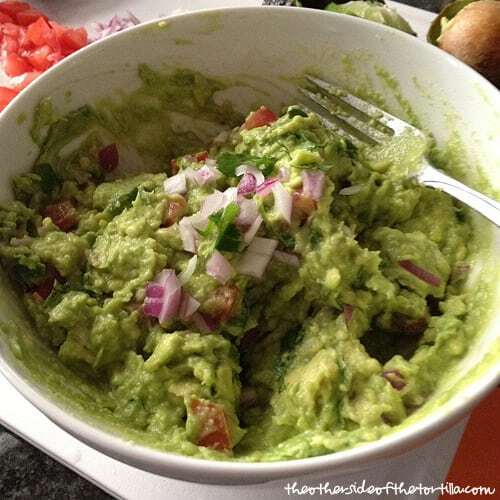 What’s your favorite non-standard ingredient to put in guacamole? 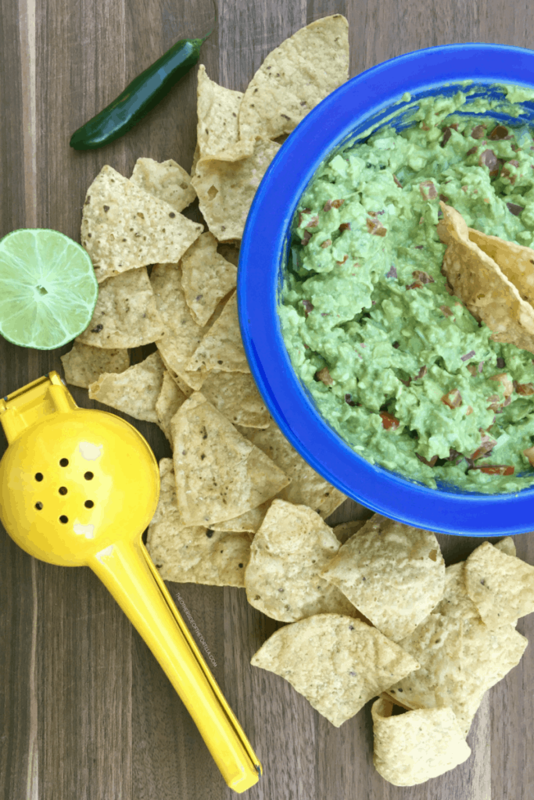 There’s an easy way to keep guacamole fresh and green—without using the pit, adding too much salt, covering it with water, milk or any of the other “tricks” you might find with a quick Google search. If you’ve ever woofed down a whole bowl of guacamole just to keep it from going brown in the refrigerator, your life is about to be changed. I promise this tip is the green-guacamole-for-days jackpot! My family is always asking me to make guacamole. Always. 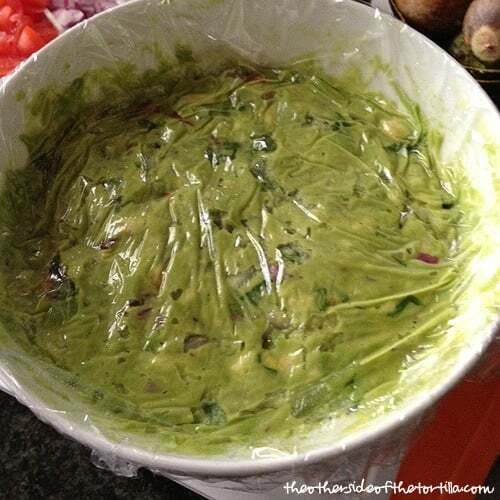 I make it for parties and barbecues, when people casually drop by and even when somebody calls and asks, “if I drop off the ingredients, will you make it for me?” My dad is by far the biggest culprit of the weekend phone call requesting a drive-by guacamole drop-off. I used to tease him that if it weren’t for the guacamole, he wouldn’t stop by as often. But with a jam-packed schedule and some travel time occasionally involved on one or both ends to get the ingredients and then deliver the goods to their final destination, it’s not always easy to make the guacamole and deliver and serve it right away. Yet, nobody would ever know that it’s usually been in the refrigerator for a full day beforehand because my guacamole always arrives perfectly green and fresh as if I just made it. I’m going to reveal a method and kitchen tip that is going to turn you into a guacamole hero. But be warned; I can’t be held responsible if friends and family start calling to drop off ingredients because you earn a reputation for having the greenest guacamole they’ve ever seen! 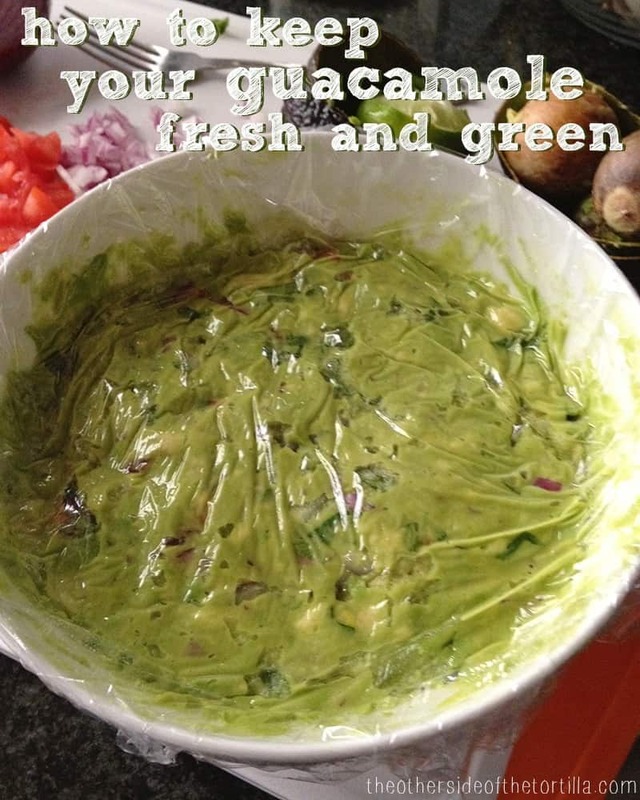 Need a basic guacamole recipe? I’ve got you covered. Also check out my fruity guacamole recipe with pineapple and pomegranate seeds. 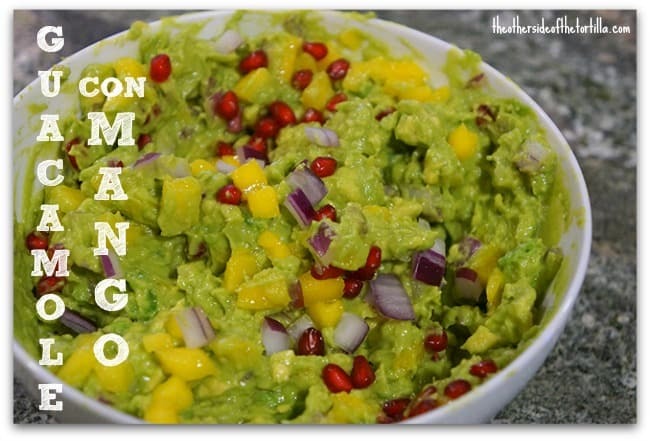 You might also like my mango guacamole recipe. STEP 1: Choose avocados that are barely ripe. They should give only very slightly when you press the skin. Prep all the ingredients (onion, chile, lime, tomato, cilantro, etc.) before you cut the avocados open. The flesh should not be too creamy/soft when you open them and you shouldn’t find brown or dark spots on the flesh at all. I posted this photo on Instagram last week as I was eating leftover guacamole in the form of tacos, also known in my household as guaca-tacos. You can find my guacamole recipe here. Sometimes I like to substitute red onion for white onion (like I did here, though it’s difficult to tell from the photo). It’s a substitution I picked up from my mom since she normally makes her guacamole with red onions. Do you ever eat guacamole tacos? I’ve been working late into the evening recently so I decided to break out my slow cooker and put it to work for me! On top of the late nights, the brutal heat wave we’ve been having over the last few weeks has made me less than happy about spending time in the kitchen after a long day, especially if it involves heating up the oven or even the stove top for more than a few minutes because I don’t want to be any hotter. 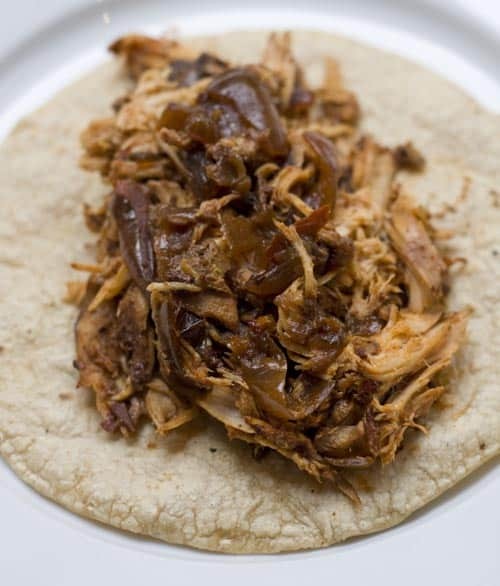 This recipe for chicken tacos is great for a few reasons: it’s super easy to make, it takes very little effort to prepare and it can be used as a filling for three different dishes so if you make a little extra you can turn it into more than one meal. It can be used just as a regular old taco filling, rolled and fried in a tortilla to make taquitos or even rolled and bathed in salsa and topped with cheese as enchiladas. The biggest bonus of all: It won’t heat up the kitchen…. I love tortilla soup. I will order it just about anywhere, at any time of year, and I’ve been known to judge the entire menu of a restaurant solely on the quality of their sopa de tortilla. I’m obsessed in every sense of the word–and having not been able to find a version I deem delicious in Chicago, I learned how to make it. This soup is very representative of a typical Mexican kitchen and uses the traditional flavors and textures of the tomato, chile, avocado, epazote and tortilla. I’ve never cared much for tomato-based soups or broths, but this soup converted me. The secret, I’ve found, is adding a few crunchy little pieces of chicharrón (also known as pork rinds or cracklings here in the U.S.). They add a depth to the soup’s flavor that I’m convinced cannot be achieved otherwise. All of my favorite places in Mexico for tortilla soup serve it similarly; all the ingredients for assembling the soup are brought to the table separately and the waiter puts it together right in front of you, almost like a little show with your meal…. Though I’ve lived in Chicago most of my life, the chilly fall weather always seems to sneak up on me. Here we are in the middle of October and I’ve not made any tortilla soup yet! Those who know me will tell you: if I go to a restaurant with tortilla soup on the menu (even if it’s the middle of summer), I’ll order it. I’m serious about this soup, folks. 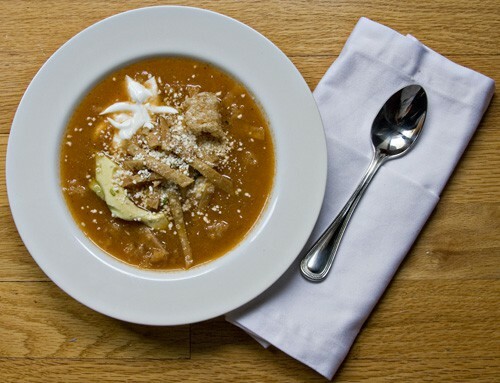 I’ve been known to judge an entire restaurant solely on the quality of the tortilla soup they serve—no matter what else is on the menu. The lack of tortilla soup in my house this far into October can only mean one thing: I’m about to go on a bender. So, I’m putting a call out. Send in your recipes and I will try each and every one I receive. The deadline to submit will be Friday, October 23rd and I’ll report back with both my recipe and my favorite recipe submitted by readers the week of November 15th. I’ve got several favorite places in Mexico City where I go for tortilla soup and I’ll share those along with my recipe, too. You can submit your recipes here in the comments, or if you prefer, via email by clicking on the contact section to your right. There is one condition: your soup must be made from scratch with fresh ingredients (no canned soup bases) and should be based on tomatoes. I won’t try any recipe that isn’t based on tomatoes because then it wouldn’t be traditional tortilla soup.